When I was a kid I spent countless hours in my fathers office after school. Once my homework was finished I became his 'assistant'. Once a week on Friday, came little rituals such as sharpen all the pencils with the hand-cranked sharpener, my favorite playtool. But there was something more. There was one mythical object in the office: a massive safe that belonged to my grandfather. It was no longer in use and its heavy door always remained ajar since he had retired. I was allowed to play with it. I rotated the dials listening to the tantalizing clicking. One Friday afternoon much to my surprise I found the safe closed. When I asked my father, he smiled at me and challenged me: "Why not try to open it?" He handed over the key, explained in detail how a combination lock works and what I had to do once the combination set. Easy enough. No time to waste. Cracking the code would prove to be a piece of cake for a masterthief like me. I still remember I was upset when he revealed two of the secret digits right after I started. As if he doubted my capabilities. After hours testing ceaselessly the two remaining combinations, my ear against the safe's door to detect any unusual tick, I pretended giving up. Going home my father revealed the third missing digit. Aha... only he did not specify to which of the two remaining combinations it belonged. No question, the safe would not resist much longer. On Wednesday he finally revealed me that the third digit went to the third dial. I gladly accepted. From then on success seemed imminent. After all, there were only 60 positions left. I took me two more 'sessions' before I succeeded. The safe was no longer empty. On a shelf lay a banknote of 5 francs and a little handwritten message ... from my grandfather! Only much later did I understand it should have been an eye-opener. I was far too young to get the message when I was twelve. But my father was right. You may judge the story 'way over the top'. My father simply liked 'games' like these, challenging me to solve a problem on my own first. He never gave a solution just like that, he wanted to see my commitment before revealing another tiny piece of the puzzle. Challenges resulting in eye-openers are what I want to offer you during our consulting sessions too. Rest assured, there will be no games; simply aha moments revealing the true potential of your site and what you can achieve through your web presence. How? 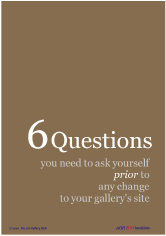 By giving you the key that will enable you to turn your gallery's site into a tool that not only delivers the results you expect but amplifies them. Nevertheless, the initiative for each next step will always be up to you. I could do it all and deliver ready-made standard solutions. But I don't. You get to turn the key. Because I simply don't believe in the approach where the client is at the mercy of the consultant. This approach is typical of conventional consulting: performing tasks while the client is little or not involved at all because he is comfortably tucked away in 'listening only' mode. And frankly, ready-made solutions are by definition 'one size fits all'. I don't think you would be happy with these either. Yes, I ask my clients for their commitment. You must really be committed and motivated to work together towards the outcome we set during the consecutive steps of our collaboration. This is why the major part of each of our consulting session is focused on implementation. There is no way around if you want to see lasting results. I agree, they should be fun and rewarding. Nothing more energizing than to share little moments marked by a "Honestly, I never looked at my site this way" or "I had never imagined that one little tweak could have such an impact". Do you want to see what more to expect? Have a glimpse of some unusual approaches or what consulting option best corresponds to your expectations. If you are ready please contact me. It will be a pleasure to discover together how I can help you. P.S. You may be curious to know what my grandfather had written on the snippet of paper my father discovered and kept carefully. "All successses in life are a combination of taking risks, having faith, perseverance and a little bit of luck. You just proved you have all three qualities. Wish you all the luck dear son. But please STAY OUT of the safe when I am out of office!!! He was a shrewd hard working business man and sometimes great fun for all of us. I adored him.